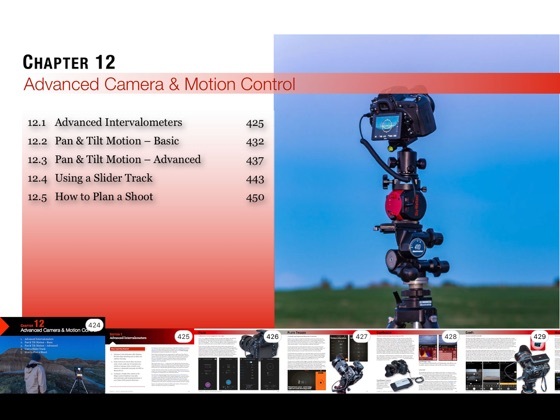 • How to plan a time-lapse shoot and calculate the balance of exposure timevs. frame count vs. length of shoot. Alan Dyer has authored or co-authored several print guidebooks for amateur astronomers, notably The Backyard Astronomer’s Guide with Terence Dickinson. Alan’s astrophotos have appeared in calendars and magazines such as SkyNews, Astronomy, Sky and Telescope, and National Geographic. They’ve been featured on websites such as CBSNews.com, NBCNews.com, Spaceweather.com, UniverseToday.com, and Astronomy Picture of the Day. Alan serves as a contributing editor to SkyNews and Sky and Telescope magazines. My first after-hours time lapse was pretty bad. My daughter thought it was “neat” but I knew it could be so much better, so I came here for some education. 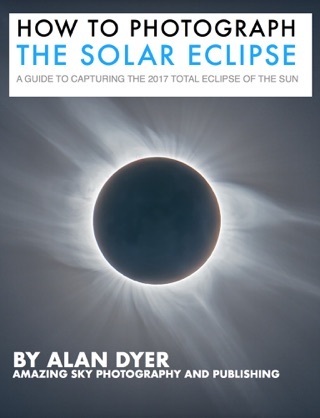 As a subscriber to "Sky & Telescope" I was familiar with Mr. Dyer - he’s been writing about astronomy gear and taking astrophotos for a long time. Evidently he has motion time-lapses in his bag of tricks, as well. With nearly 400 pages of content, it’s safe to say nearly everyone will get their money’s worth from this book. Does it cover everything? Generally yes, although I would have preferred he not put so much emphasis on using Adobe software to process his images. I was hoping not to give them any more of my money, but perhaps that attitude will have to change. More importantly is the format, and the potential for enhanced learning, the author utilizes by making this an ibook, and he does it so well. Just about every page contains a picture you can zoom into, an interactive graphic, an actual movie, or a pop-up tip. My favorites are the side-by-side comparison pictures of differing techniques and the thumbnail-actuated screenshots of software programs illustrating the labeled process of manipulating images. Additionally you can highlight imortant passages and find them easily with the “notes” tool; the same is true of bookmarks. Sprinkled throughout are links to external websites of manufacturers and developers. Just press “Command+Tab” to return to the book. It’s just not possible to find this much pertinant information so easily using the old-fashioned way. 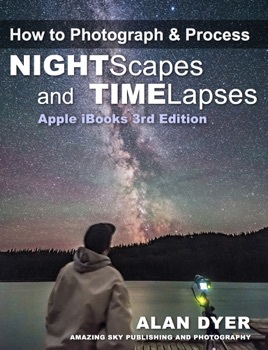 If you’re really interested in the subject and want to learn more, then you need to put “Nightscapes and Timelapses” in your bag of tricks. Night photography and time-lapse can be complicated. Especially if you are new to it. Having the right gear for your shoot, planning, creating/controlling numerous settings, framing, post processing, having the right software, timelapse, motion, multi-axis motion, image stacking, doing day to night transitions... its a lot to keep in mind. When you put all the factors together it can be overwhelming. Alan has created a critical resource for both new photographers and experienced folks looking to improve their craft. 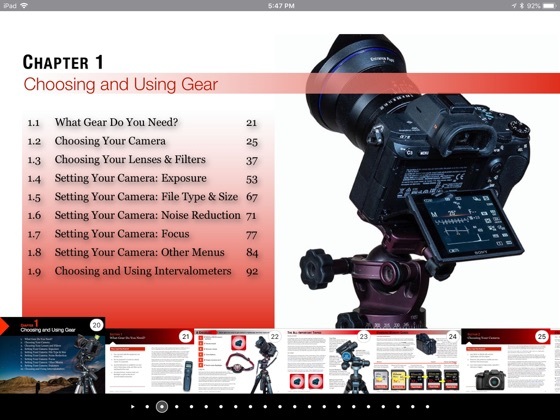 In this book, he lays out a clear and structured workflow that allows you to get your setup dialed so that you can focus on your shot and minimize the amount of time you spend on your gear. Most importantly, he does an incredible job of using text, photos, and videos to actually show you what to do during your shoot. This is a great book. 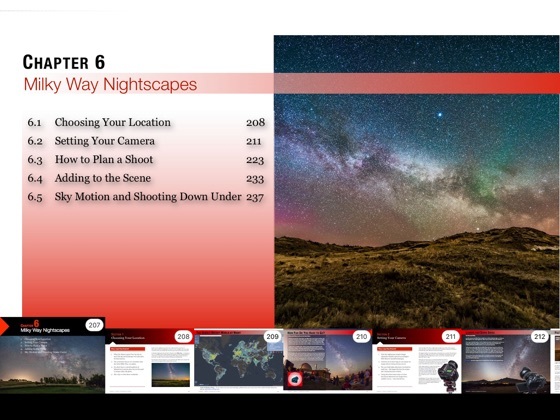 If you are considering exploring the wonderful world of astrophotography, this is THE book, the only iBook you need! I’ve been a planetarium astronomy educator for 40 years, even longer photographing the night sky. 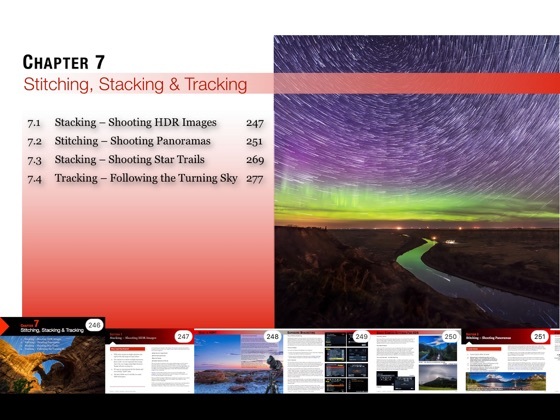 Alan Dyer’s masterpiece is my “Go To” resource for all things related to astrophotography. 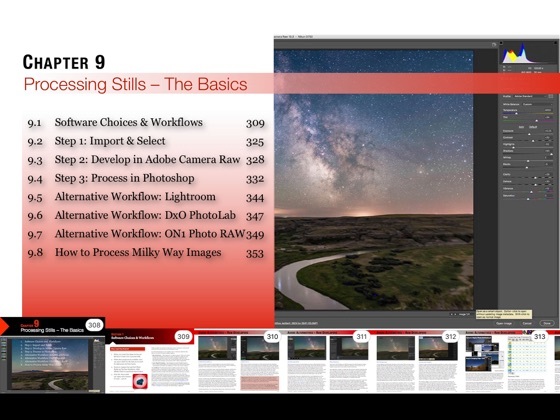 I’ve taken classes in astrophotography and taught my own, and I always recommend Mr. Dyer’s book as one of the best resources available. Amazingly thorough, I appreciate the free updates that are periodically issued which follow advances in camera technology and image processing. I’ve invested thousands in cameras, lenses, tripods, and travel to enjoy and record the wonders of the night sky. This book, however, has provent to have been one of the best investments I could have ever made! Thanks and clear skies, Alan!